Every now and then, you read a book that makes you laugh and makes you think. 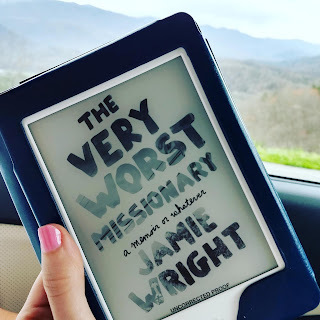 For me, The Very Worst Missionary by Jamie Wright is just that book. The author gained fame as a blogger while on the mission field in Costa Rica. However, I was not one of her many fans – simply because I had not found her yet. And, now that I have found her, I am going to be telling everybody to READ HER BOOK! The book, essentially, is Jamie’s story. It covers her personal religious background, which is unique. And, then, her teen pregnancy and marriage to her husband (they’re still together). It was during these trying years as a young mom that she became involved in The Church (capital “C” on purpose) and was wholeheartedly invested in mom’s groups and what have you. After her husband embraced The Church, they became the go-to couple for church service and spent time working with the youth. After serving as youth group leaders, they felt called (or so they thought) to be missionaries. They ended up working as missionaries in Costa Rica for several years. It was during these years on the mission field where Jamie began to really address some tough faith questions and general concerns about Christian missions as a whole. She came to discover that maybe what she was doing was not so helpful after all, and she began to feel concerned about being a cog in the Christian missions machine. Aside from the memoir part of the book, Jamie’s reflections on her personal journey, marriage, and the Christian community are at times hilarious and profound. She stays true to her faith, but she raises challenging questions about why the North American Christian community does some of the things it does. But, while she pokes fun at some of the ultra-churchy experiences she had, she also makes fun of herself. And, she treats those who do some of the same things gently acknowledging that those moms’ groups were vital to her. And, for anyone new to her writing, she does not hold back. She is crass and uses plenty of colorful language. Anyone easily offended by four-letter words should pass on this one – but you will be missing out. Then again, maybe these are the same people who would withdraw financial support because a four-letter word means you can’t serve (such as happened to the author). Or, if you don’t want to find out about how North American missions are often viewed by those who live in foreign countries, you might want to pass. After they left Costa Rica, her husband took on a church leadership role where he works to advise churches about missions, and Jamie advocates for the changes that need to be made. So, this is not a book about bashing missions. It is a book that tells one couple’s experiences and lessons they learned and what they want to change. * It was released this week, so go ahead and order it or put it on hold at your local library! For my Spartanburg friends, the audio is available on Hoopla. Hooray!